The Leadership Dynamics Group Strategic Development Process™ can help you meet these challenges with an outside-in perspective. Is from one source; complete and convenient. Turns theory into practical, common sense application. Is flexible and affordable for any size organization. Results are measured by return on investment. Strategic Development, a proven process that gets results, is unique in its ability to merge organizational strategic planning with organizational development - all in one consistent implementation model. This practical, common-sense model provides diverse services in a single, comprehensive process. 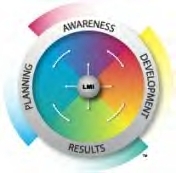 Leadership Dynamics Group clients access one service for total planning and development resources. The wheel signifies a continuous process, one which can move in either direction and begin at any quadrant, based on the client's needs. Transformation cannot take place in a vacuum void of insight. The creation of organizational awareness is a continuous process stimulated by effective leaders at every level of the organization. A high degree of organizational awareness improves organizational analysis, hiring and staffing decisions, team building, communication, culture, and leadership style. Research shows, however, that very few organizations actually manage operations by a specific plan and strategy ... why? Very simple ... focus! Leadership Dynamics Group has answered that question for organizations with a practical, common-sense, planning model that fosters buy-in at every level of the organization. An organization can transform its results by simply developing 10% of the unused potential of its people. A continuous development process builds a results-based leadership culture, effective managers, and enhanced productivity. The most well-designed plan and strategy is only as good as its implementation. Failure in strategic planning is usually the result of ineffective results management. The Leadership Dynamics Group Results Management System™ and software allows any size organization the ability to do just that at every level of the organization, even in remote locations. The overall plan and strategy becomes the benchmark of daily operations and long-term vision.